Can you ever go home? And should you? Worcester, Massachusetts is a long way from Manhattan—economically, socially, and spiritually. Jim Monaghan, a young business man, grew up there and has mostly escaped it. Until he returns to Worcester. Jim falls back into his alcohol-fueled, youthful, crazy days with his old pal, Joe Rousseau, a wild man who is in trouble with a local gang. Jim also has to ping pong between his divorced parents, both of whom seem to be at risk of fading from life. Jim and the novel move from wild romp to and pensive torpor. Jim’s life is fraught with divisions: Worcester vs. Manhattan, old life vs. new life, employment vs. unemployment, sobriety vs. intoxication, dad vs. mom, edgy Worcester chick vs. New York City girlfriend, etc. Dodds has written a fine novel. He has a voice wholly his own, and he captures the elemental good and bad in the American male. Joe’s recklessness and gang feud create a looming peril that keeps the reader on edge. Where will the chips fall? And will Jim ever make it back to Manhattan and become what he is? 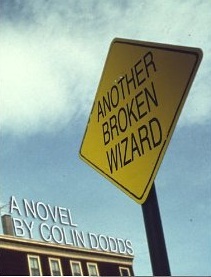 Another Broken Wizard (Kindle, 2011) is available on Kindle and other e-platforms at http://anotherbrokenwizard.wordpress.com/.